Magdeburg, Germany and New Delhi, India, November 5, 2018 – A new era in the management of glaucoma is ushered in by a landmark study published in the Journal of Glaucoma, Official Journal of the World Glaucoma Association. Patients with primary open angle glaucoma (POAG) showed significant improvements of both ocular and general health after participating in a program of mindful meditation focused on breathing compared to the control group that did not partake. "We know that chronic stress can lead to elevation of blood pressure (systemic hypertension) but seldom think about its known effect on the eye by provoking a high intraocular pressure (IOP). This is the first study showing that a relaxation program with meditation can lower IOP in glaucoma patients and improve their quality of life by lowering stress hormones like cortisol. Mindful meditation is easy to do, even by patients who are elderly and bedridden," said the study's lead investigator Tanuj Dada, MD, from the Dr. Rajendra Prasad Centre for Ophthalmic Sciences, All India Institute of Medical Sciences, New Delhi, India. Co-investigator, Bernhard Sabel, PhD, from the Institute of Medical Psychology, Otto-.v.-Guericke University of Magdeburg, Germany, added, "The study suggests that mental stress may be one of the main causal factors for glaucoma, and using this ancient meditation technique to reduce stress is a powerful tool to treat the patient as a whole and not just the eye, a holistic approach to manage the disease and also improve overall patient well-being." The scientists randomly divided 90 POAG patients (all of whom were being treated with eye drops before and during the study) into two groups. One group underwent a three-week program of meditation and breathing exercises with a trained yoga instructor for 60 minutes every morning while continuing taking their eye drops. The second group also continued taking the eye drops but did not meditate. 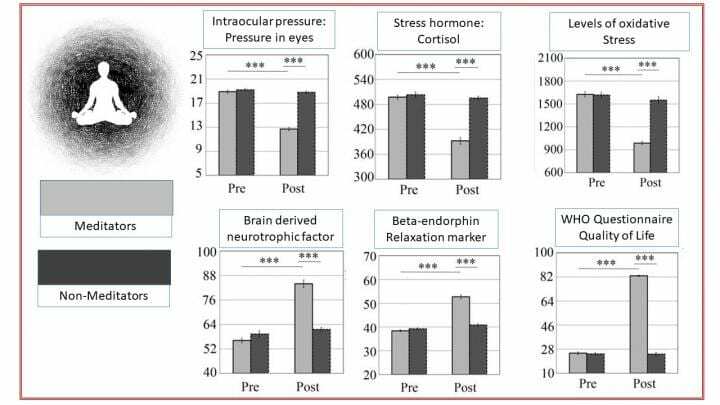 At the end of three weeks, 75% of the patients who practiced meditation demonstrated a significant 25% drop in eye pressure, which was not observed in the control group. Additionally, meditation positively influenced other indicators, such as reduced cortisol levels (stress hormone), increases in beta-endorphins and brain-derived neurotrophic factors and reduced oxidative stress and pro-inflammatory markers (interleukins). Glaucoma is the leading cause of blindness globally, affecting nearly 70 million people. Lowering of IOP is the only proven therapy, which is currently achieved with eye drops, laser therapy or surgery. These therapies are costly and have ocular and systemic side effects that can adversely affect the health-related quality of life of glaucoma patients. Patients' outcomes improve as IOP is reduced, which helps to prevent further damage to the optic nerve. By employing a meditation approach, there is a reduced need for medications, which helps reduce side effects and also costs to the patient and the healthcare system. In addition, meditation reduces stress hormones, which improves patients' quality of life. It thus helps patients cope much more successfully with the psychological burden caused by this blinding disorder. "Our findings open an exciting avenue of harnessing the power of the brain to cure ailments of the human body. A majority of human diseases have an underlying psychological component, and it is the psychology of the patient that meditation targets. Reducing stress hormone levels with evidence-based methods can impact many organs in the body, including the eyes. More research is now needed to explore the exciting prospect of whether meditation can also serve to reduce or stop the progression of vision loss or even achieve vision restoration," explained study co-author Muneeb Faiq, PhD, All India Institute of Medical Sciences, New Delhi, India. Although yoga and meditation, key elements for holistic health, have been practiced for more than 5,000-years in ancient India, they are not well known to modern doctors and currently not used in medical practice. Most people identify yoga with physical postures and exercises, although the most benefit comes from breathing exercises and meditation that reduce stress hormone release by relaxation and thus harmonize the "mind-body" relationship.